Due to the nature of handmade furniture, slight variations in overall dimensions may occur. All leather is of the highest quality but is a natural material, so variations in texture and markings may occur. With it’s curvilinear form, bold massing, and thoughtful detailing, the Souffle Settee is a modern icon. This settee features solid cast burnished brass legs and an artisanal ruched leather body which is available in a curated selection of leathers. Non-ruched options are also available. With it’s curvilinear form, bold massing, and thoughtful detailing, the Souffle Cocktail Chair is a modern icon. This quirky chair-table combination features solid oak legs and tabletop with a hand-cerused, ebonized or natural finish and an artisinal ruched leather body which is available in a curated selection of leathers. Non-ruched options are also available. With it’s curvilinear form, bold massing, and thoughtful detailing, the Souffle Bench is a modern icon. This wide bench features solid cast burnished brass legs and an artisanal ruched leather body which is available in a curated selection of leathers. Non-ruched options are also available. With it’s curvilinear form, bold massing, and thoughtful detailing, the Souffle Ottoman is a modern icon. 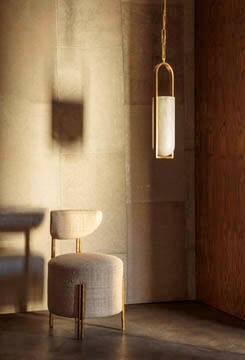 This petite ottoman features solid cast burnished brass legs and an artisanal ruched leather body which is available in a curated selection of leathers. It makes a statment as a lone occasional peice but also pairs perfecly with the Souffle Chair. Non-ruched options are also available.